I spent part of my mother's day today donating clothing and household goods. Every spring I go through my house and donate any items that we don't need or want any longer. My kids are so used to going through their toys that they are almost always cooperative and rarely put up a fight. There is something so satisfying about seeing a clean house and teaching my kids about recycling old goods instead of throwing them in the trash. I also put out a number of broken items at the curb and like always someone took the items off the curb for their own use. This is popular in my area, curbside furniture/trash pick-up is common place. Since it was mother's day today I made yesterday's meal quick and only requiring one pot. I tried a new recipe for Spanish Style Chicken and Rice from the December 2011 issue of Woman's Day magazine. This recipe has 11 ingredients. It takes 35 minutes of total time, 20 minutes of which is active and makes 4 servings. I only made a few changes to the original recipe. First I used a Dutch oven to make the dish. They are great for making one pot meals and a valuable kitchen investment. I chose to leave off the chopped parsley as a topping and I cut the chicken into 1-inch pieces instead of the 3-inch pieces suggested by the recipe. Finally, my family loves chopped olives so I used 3/4 of a cup of sliced olives for topping. I really like that this recipe only has 7 grams of fat and 42 grams of protein per serving. It was popular with my whole family, even though it has a slight spicy kick from the diced chilies. Since it only uses one pot it takes very little clean-up, which is always nice for a quick week night meal. 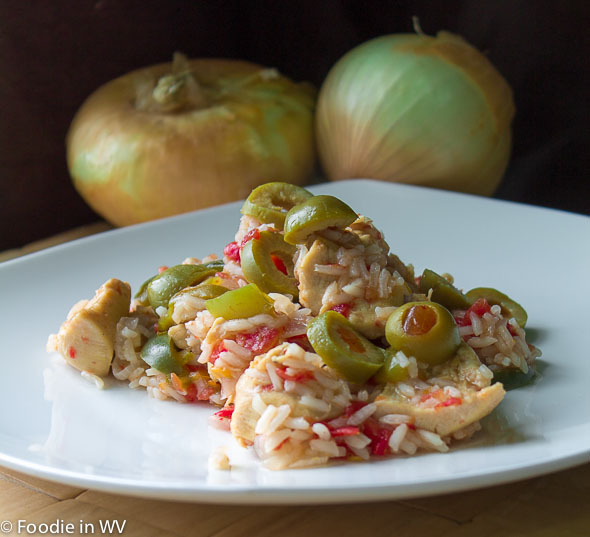 For the recipe go to Spanish Style Chicken and Rice Recipe. I love my Dutch oven! It is fantastic. It's too bad my Cuban has a strange dislike of olives. I love them and don't understand why he doesn't! HI! I'm your newest follower from the blog hop! Come visit me if you get a chance! Hope you're having a great weekend! I love all your photos, very pretty! This simple looks divine! I just finished up grilled chicken and capers and tis would have been perfect for what I craved today on MY mother's day. Thanks :) It is so simple too, I love that it only takes one pot! Donating is a good thing. we need more people like you who think about poor people and help them . Keep it up ! I agree that it is so much better than throwing things away! I use Freecycle a lot - that way I post what I am donating and it goes to someone that wants it. That's how I got rid of all my baby stuff back in the day. People always can use that stuff and it's way better than throwing it away. I think I may be the only one I know that hasn't tried Freecycle :) I need to check it out! I've marked things free at the curb too and you're right. People typically DO pick it up! Love that! Your meal looks deeeeelish! 7 grams of fat and 42 grams of protein per serving - this is perfect for my training now. Looks yummy! The recipe looks great, one pot cooking rocks! !